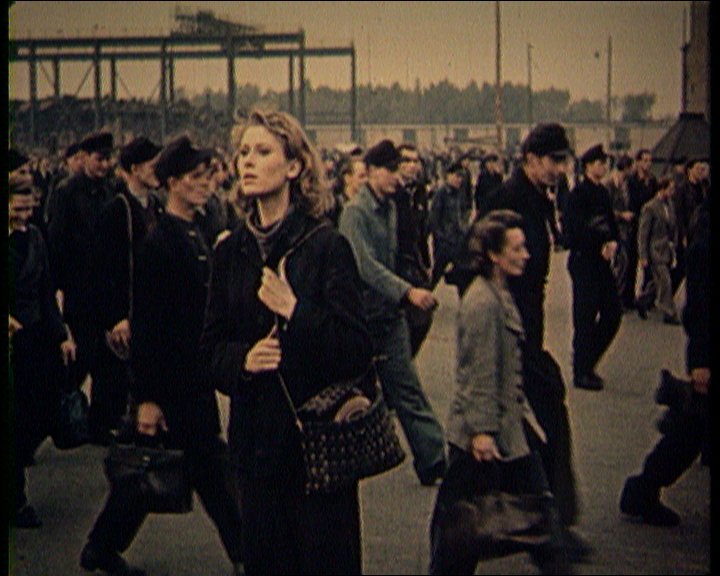 Harun Farocki, Sorties d’usines en onze décennies / Workers Leaving the Factory in Eleven Decades, 2006. Digital b/w and color video, sound, looped, 12 monitors installation. 36 min. cumulated duration. Video still. Harun Farocki, Eye/Machine III, 2003. Digital color video, sound. Double projection installation. 25 min. Digital video still. From October 19 to December 1, 2007, the Leonard & Bina Ellen Art Gallery will present six installations by German filmmaker Harun Farocki, some of which will be premiering in North America. The appearance of Farocki’s filmic montages in the gallery environment, in which documentary visuals are subtly accompanied by a spoken commentary, has allowed for his incisive investigation of the image, its demands and its profound implications for the conditions of existence and of production today, to achieve a new spatial deployment – one with multiple vectors – that provokes in the viewer who is “in motion“, another kind of relationship with the temporality and the conceptual framework at play in his films. In Section (Schnittstelle) his first installation, he describes and reflects upon his manner of working at the editing table where image and text, inseparable elements, cross one another. Section will be accompanied by four other installations namely Eye/Machine III (2003); Counter Music, (2004); Workers Leaving the Factory in Eleven Decades (2006) and Dubbing (2006). In addition the 16 mm film Inextinguishable Fire (1969), in which he stakes out the territory of his filmic investigations, will be screened in the gallery. The various connections between war, industry, and media. Investigate the ways in which Harun Farocki examines these connections in his work. The ways in which the viewer is invited to reexamine the familiar and potentially arrive at a new understanding of images through Farocki’s recovery, recutting, and reframing of existing images. The impact that the cinematographic image has had on our lives in terms of making the world visible to us in entirely new ways. The intersection of film, photography, video art, digital media, and mechanized vision in the work of Harun Farocki. How are our experiences of war and death shaped by both the photographed and the filmed image? How does Farocki use sound in his work and how does his use of sound serve to shape the narratives he constructs? In a world that is saturated with images, we continually encounter a repetition of the same narratives and images and they become easy to ignore. How does Farocki’s use of images slow things down and focus our attention? How does the presentational mode direct our reception of as well as our response and reaction to Farocki’s work? Does our ability to recognize borrowed images and film sequences alter the ways in which we respond to Farocki’s work ? Is it necessary that we be able to identify the images and their sources in order to understand them? Exhibition produced by the Leonard & Bina Ellen Art Gallery with the support of the Canada Council for the Arts, the Goethe-Institut Montréal, the Canadian Centre for German and European Studies, Université de Montréal, and the Agnes Etherington Art Centre, Queen’s University. Harun Farocki was born in Neutitschein, in German-annexed Czechoslovakia, in 1944. Since graduating from Berlin’s Deutsche Film-und Fernsehakademie in 1966, he has directed more that 90 films that include feature films, documentaries and television programs. He has also collaborated with numerous filmmakers as scriptwriter, actor and producer. His films have been the subject of retrospectives at the Museu d’Art Contemporani de Barcelona in 2004, and the Vienna Filmmuseum in 2006. He has participated in important international events such as the 2005 Carnegie International and Documenta XII (2007). He has held many teaching posts and between 1993 and 1999 taught at the University of California Berkeley. Since 2004 he has been Visiting professor at Vienna’s Akademie für Bildende Künste. Harun Farocki is a media theorist and writer and was an editor for the influential German film journal Filmkritik from 1974 to 1984. He lives and works in Berlin. Ehmann, Antje, and Harun Farocki, eds. Kino wie noch nie / Cinema like never before. Vienna : Generali Foundation; Cologne : Verlag der Buchhandlung Walther König, 2006. Elsaesser, Thomas, ed. 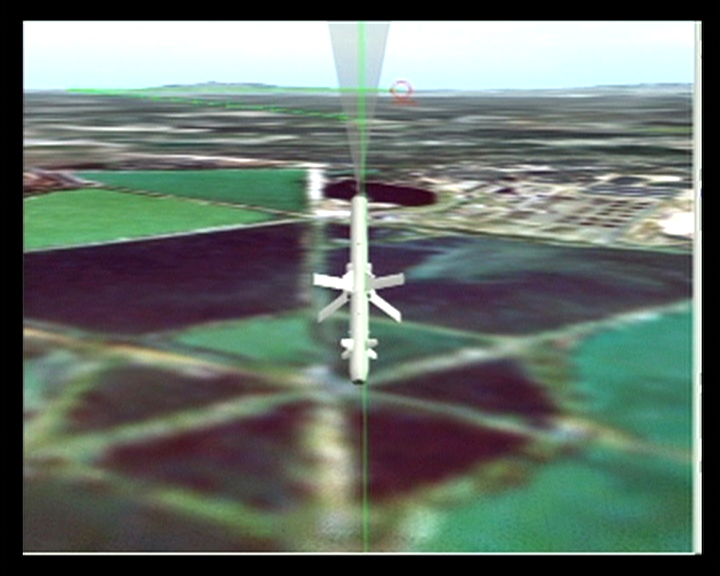 Harun Farocki : Working on the Sight-Lines. Amsterdam : Amsterdam University Press, 2004. Farocki, Harun. Films. Courbevoie : Theâtre Typographique, 2007. Farocki, Harun. Nachdruck / Imprint. Texte / Writings. Berlin/New York : Lukas & Sternberg; Berlin : Verlag Vorwerk, 2001. Farocki, Harun. Reconnaître et poursuivre. Courbevoie : Theâtre Typographique, 2002. Inextinguishable Fire, 1969, 25 min. In Inextinguishable Fire Farocki refrains from making any sort of emotional appeal and above all else attempts to portray the construction of thought or ideas the way a photo montage does. The work is a direct political critique, an indictment of Dow Chemical’s production of Napalm B for the Vietnam War as well as of German involvement in this multinational corporation’s activities. It questions how a democracy of production could end the production of weaponry. Interface examines the question of what it means to work with existing images rather than producing one’s own. It serves as an introduction to Farocki’s practice, his views on film, and his use of archival images. Eye/Machine III, 2003, 25 min. Eye/Machine III, structures material around the concept of the operational image. These are images which do not portray a process, but are themselves part of a process. As early as the 80s, cruise missiles used a stored image of a real landscape, then took an actual image during flight; the software compared the two images, resulting in a comparison between idea and reality, a confrontation between pure war and the impurity of the actual. This confrontation is also a montage and montage is always about similarity and difference. Counter Music is a double projection installation that combines text from a variety of sources as well as “found footage” originating from surveillance imagery as well as from films by pioneer filmmakers Dziga Vertov and Walter Ruttmann. Farocki considers contemporary surveillance, the disappearance of industry, and image-production, particularly in the name of security, as contemporary society’s main business. In Workers Leaving the Factory in Eleven Decades, the installation of scenes from throughout film’s history of workers leaving the factory is displayed simultaneously on twelve monitors. In cinematography, perception and concept diverge. Indeed history’s first film, Lumière’s La sortie des usines Lumière, shows a building that doesn’t look like a factory at all. It looks more like a farm. When it comes to social conflict, the show place “in front of a factory”, is very significant; when it comes to a private life of a film’s character, which really only begins after work, the factory is relegated to the background. The existence of factories and movie stars are not compatible. Factories – and the whole subject of labor – are at the fringes of film history. In Dubbing, the famous “Are you talking to me?” sequence from Taxi Driver is seen and heard in an endless loop comprising lip-synchronic versions in five different languages with accompanying subtitles. Made in collaboration with Antje Ehmann. Bluminger, Christa. “Harun Farocki : Critical Strategies.” Parachute. III June – August (2003) : 112-25. Farocki, Harun. “Influences Transversales,” Trafic. 43 (2002) : 19-24. Farocki, Harun. “Phantom Images.” Public. 29 (2004) : 12-24. Fischli, B. “Qui est Harun Farocki?” La Revue de la Cinémathèque. 15 (1992) : 14-15. Foster, Hal. “Vision Quest : The Cinema of Harun Farocki.” Artforum International. 43. 3 (2004) : 156-61, 250. Griffin, Tim. “Viewfinder.” Artforum International. 43. 3 (2004) : 162-3.